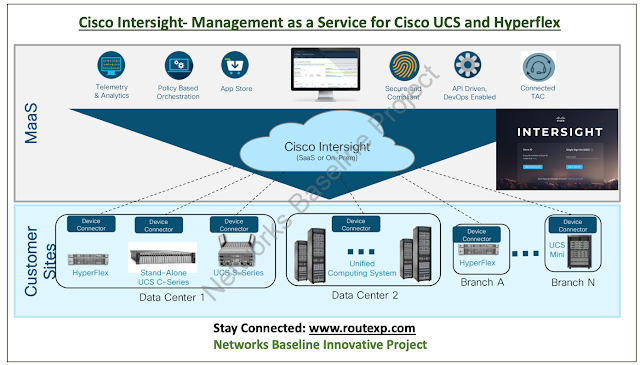 Today I am going to talk about Cisco Intersight, most of you heard about Cisco Intersight and is used to manage software as a service platformer you can say that it can be work as Management as a service which helps to manage Cisco UCS and Cisco Hyperflex infrastructure. Well talking about Cisco Intersight which comprises a RESTful API to deliver full programmability and has integrations with third-party tools and systems. The platform and the associated systems are DevOps facilitated to enable continuous delivery. This is one of the most important topics in Cisco CCIE Datacenter LAB exams as Cisco UCS and Cisco Hyperflex are the solutions for any enterprise Compute and Storage and if you want to manage it can be done through Cisco Intersight. What are the benefits of Cisco Intersight? There are lot of benefits using Cisco Intersight, you can have a single management plane to manage Cisco UCS and Hyperflex. Cisco UCS servers and storage as substructure resources that can be assigned and rearranged among application workloads for more vibrant and effective use of server capability. Build multiple server profiles with just a few clicks or through the available API, automating the provisioning process. Show and report inventory information for Cisco UCS and Cisco Hyperflex systems. Track and manage firmware versions across all connected Cisco UCS and Cisco Hyperflex systems. As I discussed already that RESTful API that supports the OpenAPI Specification (OAS) to deliver complete programmability and deep integrations systems. Python and PowerShell SDKs will permit incorporations with Ansible, Chef, Puppet, and other DevOps and IT Operations Management (ITOM) tools. Which platforms are supported by Cisco Intersight? Cisco Intersight support various platforms which includes Cisco UCS Manager, Cisco IMC Software, Cisco Hyperflex, Cisco UCS Director. There are some releases supported for these platforms. Please check the exact software release which supports Cisco Intersight. If you are going to use Cisco Intersight as a virtual appliance, make sure you have the following VM requirements to set up Cisco Intersight. What are the licensing models of Cisco Intersight? Well Cisco sell Intersight in two different licensing models. One is with the Base model and other is with the essential edition. Base Edition: Base edition is a kind of free version provided to enterprises which can support both Cisco UCS and Cisco Hyperflex. You will get the global monitoring and the health information of the devices which are managed through Cisco Intersight. Essential Edition: You can get all the free features which is there in Cisco Intersight base edition, apart from it you can get policy based configuration with service profiles. It also gives the information about the firmware management and schedule updates. It has feature of remote management and vKVM support. It also Supports the OpenAPI standard to provide full programmability which is not there in the Base edition of Cisco Intersight.